Combining protection and an impressive finish, Rawlins Paints' range of wood finishes for exterior timber is impressive. So, whether you’re looking to apply barn paint and spruce up your outside buildings, or looking for some exterior wood stain, exterior wood varnish or even some decking colours to smarten up your garden, you’ll find the perfect paint, oil, stain or varnish on our product pages. These leading exterior wood finishes from Blackfriar, Jotun, Bedec, Coo-Var and many more, can restore, rejuvenate and recolour tired wooden and timber cladding, add long-lasting protection to timber surfaces, structures and decking, and are perfect for commercial and high-end domestic purposes. 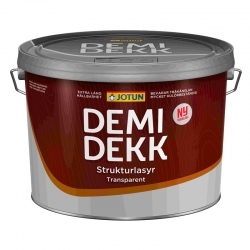 Jotun’s Butinox wood finish range has been discontinued by the manufacturer, who have replaced it with the excellent and hugely popular Demidekk range. 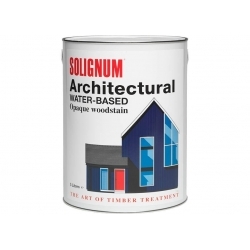 These products will deliver a professional finish in most outdoor settings, and on wood or timber in deteriorating conditions, where sufficient repairs and preparation has been undertaken. Always check the product datasheet to ensure specific product features and benefits, and that a product is suitable across multiple tasks, projects and surfaces, from cladding to exterior joinery, and garden furniture to new decking. 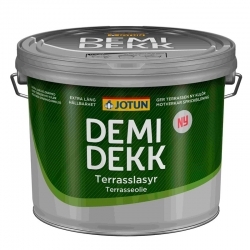 Jotun Demidekk Decking and Garden Stain is ideal for patio decking, balcony floors, garden furniture and pergolas, delivering up to 3 years’ life in just a single coat. Featuring a wide range of organic and seasonal colours to make the finishing details look as natural as possible in its environment, they range from oak and chestnut to more exotic wood colourings and staged fading of grey, and dark blacks and browns to a more striking and contrasting yellow, orange, signal red and blue. Jotun Demidekk Translucent Woodstain is a modern hybrid stain based on AMA technology (alkyd modified acrylate) featuring typical translucent outdoor colourings – Teak, Walnut, Exotic Wood, Terrace Brown and various shades of grey – and can protect timber for up to 8 years. Jotun Demidekk Ultimate is an opaque, waterborne exterior wood protection coating with very good colour stability and long maintenance cycles. 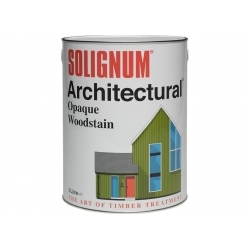 Available in an extensive range of woodland and natural surrounding colours, it can be used on new woodwork and previously painted and stained woods, too. 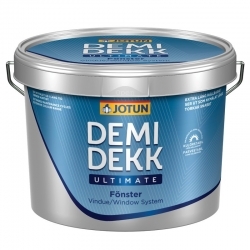 Jotun Demidekk Ultimate Windows and Doors is a high-performance paint with excellent colour and gloss retention, especially suited for exterior planed woodworks – windows and window frames, doors, and exterior trim. This product has an excellent 12 years’ life expectancy, superior colour retention and contains UV filters and fungicides for standard environmental conditions. 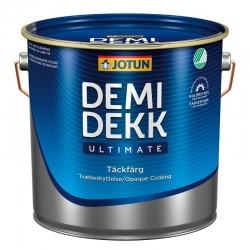 Jotun Demidekk Ultimate Helmatt is a matt finish with a bolder range of colours, such as Muted Black, Zinc, Tar Brown, and Labrador, along with more traditional Venetian Red, Demi Yellow and Sun Yellow. Perfect for timber, cladding and exterior joinery, Zinsser AllCoat Exterior Satin gives a long lasting, durable finish with a vast selection of colours available from the RAL colour range. A versatile product, AllCoat Exterior Satin can be used on a host of other outdoor surfaces, substrates and materials, including metal, masonry, plastic, UPVC and concrete. Re-coatable in one hour, like its Gloss counterpart from Zinsser, it contains a biocide to protect the dried coating against fungal degradation. For 'no frills' wood protection, you may benefit from a wood stain, wood oil or varnish from Blackfriar. Several Blackfriar’s internal wood oil finishes are also applicable for outdoor use, from Boiled Linseed Oil and Teak Oil, to Danish Oil and Raw Linseed Oil. For a more durable finish on decking, fascia, furniture, wooden structures and timber décor, try Blackfriar Exterior Varnish, or if you are located in more extreme conditions, such as coastal locations, the Scottish Highlands or the Yorkshire Moors, Blackfriar’s Super Yacht Varnish may be the better option, with its exceptional UV protection and tough and durable protection against the vagaries of the weather. When you are treating the timber in your garden decking, it’s important to make sure it’s a safe surface for people to walk on. Anti-slip deck coating and anti-slip decking paint products are listed on our site, and give lots of choice for your specific decking project. Blackfriar Anti-Slip Deck Coating is a clear deck coating that allows the wood’s natural beauty to show through. At the same time, it provides a slip-resistant floor surface, even in wet weather. If you already have some deck stain on your wood, this can be applied over it. Teamac Stable Paints are specifically formulated to be fast drying sealers for bricks, wood and plaster in stables and other outhouses. Teamac Stable Paint gives a matt white or black finish with low reflective properties. Bedec Barn Paint is a revolutionary product, ideally suited to the protection of exterior wooden, metal and plastic cladded buildings. It can be applied to previously painted surfaces - even those coated with bitumen, tar varnish or creosote. It’s tough, durable and has excellent colour retention. It will flex with the substrate rather than flake or crack.